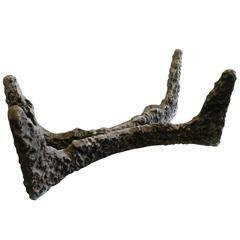 American Brutalist sculpted bronze coffee or cocktail table created by Paul Evans Studio, initialed and dated 70 on the base. The panels forming the base are sculpted with Brutalist decorative motifs and hold up a heavy rectangular glass plate. Slight chip to one corner of the glass plate. Slight chip to one corner of the glass plate. 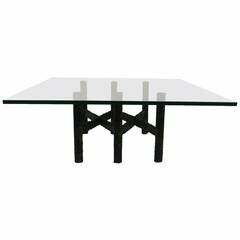 A vintage Silas Seandel mixed metal rectangular coffee or cocktail table with inset glass. Good vintage condition with age appropriate wear and patina. Small chip to glass. 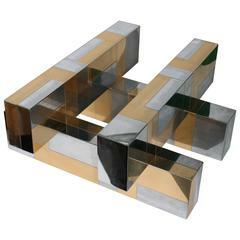 In the style of Paul Evans heavy cast metal bronze coffee table. This weighs an absolute ton! Glass top not included. 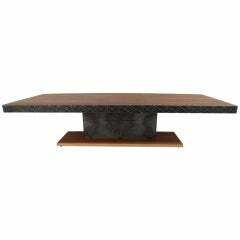 Paul Evans Studio-sculpted bronze coffee table. Vertical planes featuring different decorative motifs. Measures: Base without glass (approximate) 41" x 24" x 15.5" high. 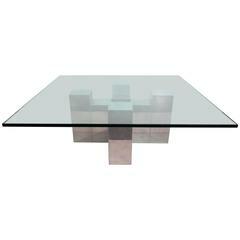 Brutalist welded steel base, plate glass top table, signed Paul Evans. 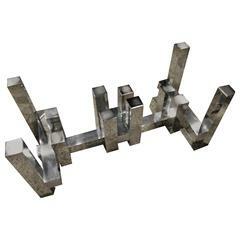 Paul Evans welded steel 1967 Brutalist cocktail table. Wonderful patina, class Evans design, retains original glass. 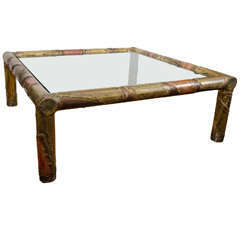 Heavy base can hold much larger glass top.